Imagine yourself in a Viking hall by the seaside. You can hear the cold waves lapping at the shore as you and your comrades eagerly await the coming of the storyteller. A hush falls over the assembly as he enters, commanding attention and respect by the sheer weight of the tales he carries. As the light fails outside, he begins his tale of a journey, long and arduous, and not a little strange. This is clearly the atmosphere Vratyas Vakyas wants to create with Heralding – The Fireblade. 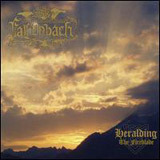 Falkenbach is essentially a one-man project, with most of the musicians appearing on Heralding being listed as session musicians. This perhaps accounts for the singularity of vision and general cohesiveness of the album – it feels very much as if you’re following the threads of a single tale as they wind through the ether, each song naturally flowing into the next. As for the songs themselves, they’re a tasty blend of blackened Viking with folk currents running throughout. Heavy, bright-edged riffs and drumming that ranges from blasting in the more blackened parts to complex, rolling fills (some sounding tribal in a very “northern” way) form the base of each song, with acoustic melodies on guitar and violin adding an epic atmosphere. Each aspect is so well-integrated with the rest that it’s hard to keep track of where the black metal ends and the epic folk journey begins; harsh, cold riffs and blasting easily give way to haunting acoustic guitars and synths overlaying gentler guitar melodies and more relaxed drumming, which drop back into more typical black metal tempered by wordless Viking choruses and midtempo melodic riffing. The overall tone and feeling is a bit different than your average batch of Viking metal; the heavy folk influences and strong acoustic melodies result in it being very heavily layered and much more subdued than, say, Ensiferum. The vocals are a mix of harsh black metal style rasping and clean singing; the vocal melodies are very simple, even in the cleanly sung parts. Both sets of vocals manage to achieve a haunting, searching, lamenting quality, full of emotion that comes across quite clearly. Given the richness of the songs, this works well, and bolsters the sense that we’re listening to an old folk tale passed down through generations. There are even a few spoken word parts that make the storytelling more literal, but still manage not to detract too much from the music itself; it helps that the words are spoken in a cadence that fits in with the simple vocal melodies without being obviously patterned after them. A couple songs in particular warrant mention. The first is Havamal, one of the most heavily folk-influenced songs and by far the album's standout track. It begins with clean singing backed up only by an acoustic guitar, which quickly gives way into one of the more epic melodies on the album, rising and falling like a ship on ocean swells. The second is the closer, Skirnir. Also one of the folkier songs, it has the most spoken word parts, including a woman playing the part of a prophetess or goddess instructing the eponymous traveler on his journey. It ends on a fairly incomplete note, though rather than feeling unfinished, it gives the impression of being the end of the first installment of a longer story, and we’ll just have to wait to hear the rest. Heralding – The Fireblade is the kind of album that makes you dream longingly of Viking halls and itch to strap a sword to your side and fight the fools that dare to challenge you. Fans of the genre will love this, though anyone who has ever had the slightest inclination to pick up a pint of mead and join in epic song with their fellow warriors will appreciate it as well.